Six feet tall and wiry, 83-year-old Nol Putnam still boasts a full head of hair. In 2004, he posed as Mr. May in Rappahannock County’s risque men’s calendar. More recently, he was featured in a provocative photography exhibit. Despite his ease in front of a camera, there’s not a shred of evidence that Putnam could be mistaken for the superficial model-type. 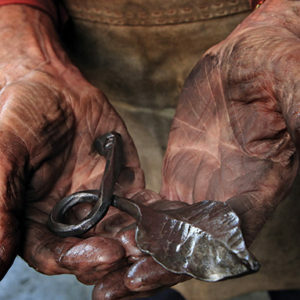 His thoughts and opinions run deep and his talent as a blacksmith even deeper. And his reputation in the world’s second-oldest trade reaches far beyond the Piedmont. 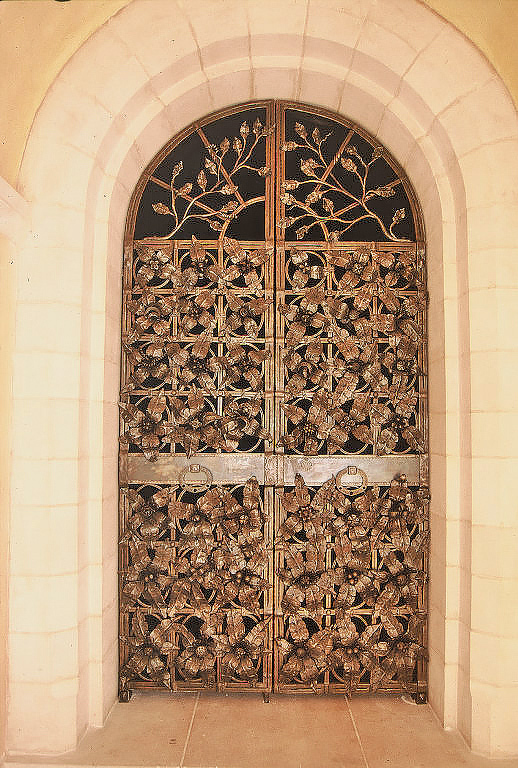 Among Putnam’s more notable works are three gates that hang in the columbarium of the National Cathedral. The Folger Gate took 1,200 hours to complete; there are 250 intricate leaves in its design. He also designed and crafted a gate for the Rockefeller Plantation in Tarrytown, N.Y. It troubles him that society is doing less work with their hands. 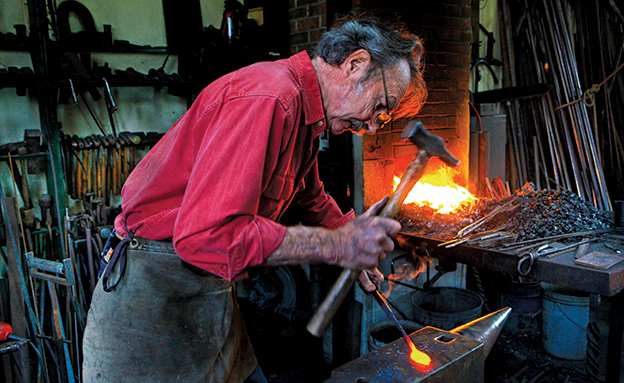 His White Oak Forge is the first thing you encounter when approaching Putnam’s five-acre property in Huntly. With its timber-frame and pitched roof, his smithy resembles a weathered New England cottage. Frayed Tibetan peace flags wave in the breeze above the enormous poplar doors leading into the forge. Various samples of his iron work hang on the walls, immediately drawing the eye upward. To the left is a huge metal table, which functions as both a drawing surface and finishing area. Several intimidating machines stand at the rear of the building, and the forge itself is nestled back in the right-hand corner. At first glance, it could be mistaken for a pizza oven, but this hearth burns coal, and exceeds temperatures of 2,500 degrees. His movements within the forge are fluid, and clearly second-nature. He stokes the fire-breathing beast of a hearth with coal, then waits for it to heat up before feeding it virgin iron. 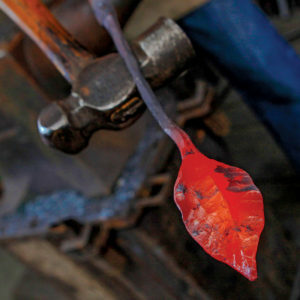 The heated metal emerges from the forge red-gold and malleable. He’s then able to shape this molten version by pressure of some kind, often hammering. Putnam displays an earthy, sinewy grit as he hammers the hot metal, demonstrating his work. And that is not the only surprising aspect of his work. There is rarely any arc welding involved in his creations, except the occasional tack here or there to join two large pieces together. A stunning example of one of his larger works can be viewed in Rappahannock County, an ornate gate. Henri Julien Rousseau’s “The Dream” was the inspiration for the work. Putnam reads as many myths as possible, in order to inform his work. He feels we have forgotten about myths, partly because of our busyness with the internet, social media, and “futile distractions like reality TV.” Many of his designs first come to him in dreams; REM sleep provides him with ideas from which he harvests a more detailed and tangible vision. For Putnam, blacksmithing is “an ancient, nostalgic trade,” and he considers its fire “mesmerizing.” He continues at his age to evolve through painting, writing, yoga, and even peace-making. Through creative endeavors, and his interaction with others, Putnam hopes he can make a larger difference. “When I’m engaged in a conversation with someone, I want to pay full attention to what that person is saying, how they are saying it, and what matters to them,” Nol says. If he disagrees, he does so respectfully by providing his viewpoint in a thoughtful and non-threatening manner. “I consider myself an elder now,” he explains, “and we are all like stones in the water. Everything we do sends a ripple effect outward into the universe.” This listening with rapt attention, and responding in kind, is yet another of Putnam’s valuable contributions to a fractured world. He began life’s journey in Boston in May of 1934. Born Oliver de Montalant Putnam, Nol lived just across Beacon Street from the Public Garden. His memories of that era, like his art, are precise and captivating. He recalls the strict formalities of his family’s upper middle class Brahmin existence — a thick rule book with “more don’ts to abide by than dos.” Eventually Putnam rebelled, developing a roguish persona still apparent in his casual, gentleman-farmer style, oft accented with a scarf about his neck. Merely four when his parents divorced, Putnam moved with his mother to a farm in rural Connecticut. “I think that move saved me from growing up to become a fiduciary attorney,” he jokes. Thanks to his mother, Anne, there was early, frequent exposure to the arts and literature. Their home, like Gertrude Stein’s, welcomed many an artist. Perhaps this is why Putnam preferred to spend time working with his hands, not studying. In an effort to curb these industrial tendencies, his mother enrolled him in the Lenox School for Boys in the Berkshires. After serving his country, he attended Trinity College in Hartford — remaining in academics, it turns out, for 23 years, including teaching Russian history at the height of the Cold War. He also wrote and gave anti-war speeches during that period. “I conducted these strictly off-campus,” he says, “because I didn’t want my views to interfere with those of the students, or distort my teaching.” Some of Putnam’s students remain in touch with him, often expressing their gratitude for his nurturing and inspiration. There’s a path leading away from his forge, which crosses a meandering stream. It opens onto a glen where the house and outbuildings are located. The setting is one of a tiny hamlet, a place where artists like Shakespeare might have sought respite. Putnam helped design and complete the finishing touches on his home. Putnam created the Folger Gate, left, for the Washington National Cathedral’s main columbarium. Installed in 1994, the 8.5-feet-tall gate weighs 1,200 pounds and took 1,200 hours to fabricate from mild steel. The exterior façade is rustic, while its interior is more contemporary, boasting thick beams and soaring ceilings. Broad panels of light slant inward from an expansive meadow beyond. The sharper angles of the architecture are softened by many of his own hand-forged details. Shapely candlesticks don bookshelves, while a dragon’s head perches at the end of a curved iron stair rail. Larger works are scattered about the house and yard. These artistic touches conjure up a feeling of enchantment. The kitchen, with hunter-green cabinets and a worn farmhouse table, adjoins the light-filled living room. There cathedral-sized windows peer out over a deck, where on a clear day, the dusky, rolling hills appear to be lording over the pasture. Here is where he keeps his journals, large leather-bound books; the pages of his current volume left open for all to read. Given his mastery of conversation, the ‘Musings’ room is likely a space where words flow as easily as the stream on his property. There are sketches in his journals as well, which are sometimes transferred to the drawing table in his forge. While en route, “these designs often change,” Putnam declares. They do so inexplicably. There’s another sort of diagram on a nearby bulletin board. He created this one to help him focus on the inner work his therapist recommended. His ex-wives’ names loom large on the board. Putnam takes responsibility for his actions, while still choosing to celebrate being alive. He appreciates those who are in his life now, and speaks with kindness and deference of those who are not. A staircase in his foyer leads down to a stunning library filled with books of every imaginable genre, and more of Putnam’s iron work. A photo of his maternal grandfather in full military regalia peers down from a high shelf. On the windowed side of the room, a bright display of red poppies steals the show. They are metal, of course, and crafted as a tribute to his five relatives who served in the Great War (two uncles, a grandfather, his father, and stepfather). The hearts, diminutive and vulnerable, flutter at the slightest movement. These two fantastic pieces — the poppies, the hearts — rest across from one another, echoing each other’s sentiment. There’s no doubt Putnam will leave behind an incredible legacy in his metal works, yet it is another work he now cherishes, and hopes will have the most powerful influence. This work is motivated by his concern for the spiritual and economic suffering of fellow humans. “There is a troublesome divide in our culture,” he says, “but as an optimist, I feel we can and should begin healing this fissure at the community level.” Putnam believes politics, religion, art, science, industry, and wealth are all superfluous without relationships, without community, and without kindred spirits that make us feel we are a part of something larger than ourselves. Perhaps his struggles as an artist fostered such a wealth of compassion. There was one year in New England when he had three mouths to feed, and only $2,000 to his name. “We bought a few chickens, some pigs, a cow, and planted a garden, which carried us through the winter,” he explains. And this is the kind of perseverance his art speaks to, by way of both its tensile strength and its universal truths. From the National Cathedral to the Piedmont and beyond, his legacy will abide. Alas he marches on, searching for opportunities to provide others, and his beloved community with hope, and maybe even a dream or two. Veronika Benson grew up in Maine and spent three years pursuing a creative writing degree at George Mason University. She is currently working on a novel. Veronika was drawn to the Piedmont region over 18 years ago because it reminded her of home, but without the harsh winters. She resides in Washington, Virginia.